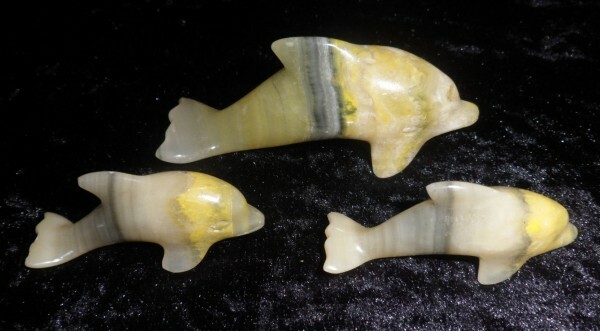 Rare Bumblebee Jasper (Eclipse Jasper) Dolphin Carving. 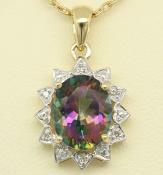 We have two sizes available, small approx. 5 cm (2 inch) and large approx. 7cm (3 inch). Dolphins have been a source of great wonder and rejuvenation for many people. They are intelligent, ancient beings with their smiling "faces," who are said to help humans in trouble are often thought of as magical and as "healers." Bumble Bee Jasper is found in the fumeroles of an Indonesian volcano, this bright colored Jasper is an excellent healer for sacral chakra disease and allergies. Not unlike Eclipse Stone. Encouraging total honesty with yourself, it represents triumph over the impossible as the bee is not aerodynamically designed to fly. Supporting the at-risk bumble bee population, it encourages ‘pollination’ of new projects and is supremely nurturing. Please Note: The angel pictured is not the one you will receive, but you will receive one similar.